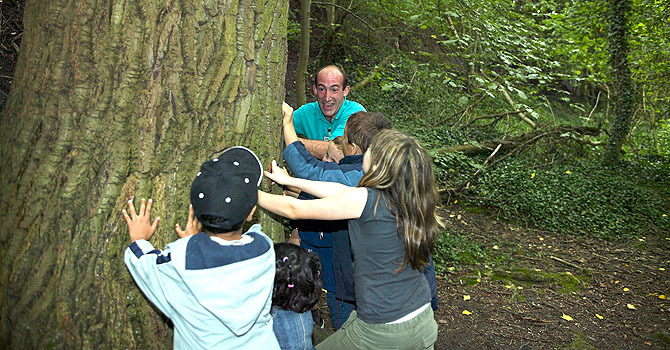 The Education programmes at CONKERS are based around highly interactive indoor and outdoor experiences offering a unique mix of Ranger-led and teacher-led activities. Please note prices for all Ranger led activity sessions include VAT. All Activity costs are based on groups of up to 35 children. 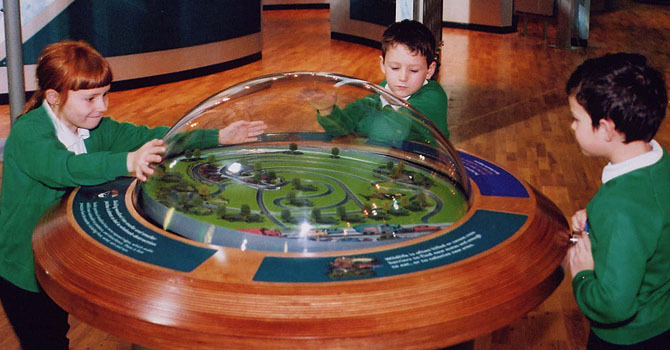 This hands-on interactive activity encourages the children to become wildlife detectives, using both their imagination and their senses. Led by our Ranger, they will search both high and low in the woodland for minibeasts and wildlife. The children will learn about the meaning and importance of habitats and even get the opportunity to build a habitat pile with their friends. Age Range 7 - 11 years. Working in small teams, this is a fun and energetic orienteering challenge. A short briefing by our Ranger and its ready steady go! Using their Conkers maps, the children go in search of clues and riddles located across our Discovery site. But which team will get back first with all the correct answers? During an interactive woodland walk the children are taught about the dispersal and life of seeds. The children are encouraged to find and identify different seeds and discuss how they might be dispersed. Seeds collected during the woodland walk are then used to decorate a kite representing wind dispersal back in our Conkers Education Room. Age Range 7 – 11 years. Working in pairs, with one as the guide and their partner blind-folded, each pair has to navigate their way through our 17 troughs that contain a variety of materials. This session explores food chains and food webs. The children are guided by our Ranger through the woodlands, where they will take a closer look at the relationship between producers and consumers. The children are introduced to the terms consumer and energy source and experience how all plants and animals within the woodland effect and rely on each other. 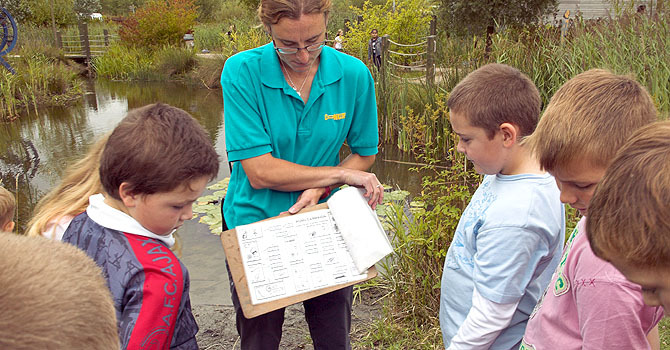 A Ranger-Led session where the children will try their hands at pond dipping, using identification charts the children are taught how to identify the creatures they have caught! In this hands-on team building session, the children are given the task of building a structure using natural woodland materials, in the shape of a tepee, shack or hut. Working together they must decide how best to construct a shelter big enough to accommodate the whole group. The children are encouraged to consider the interior design including cooking facilities. This challenging programme is split into two separate elements: building a shelter and creating a fire. Encouraged to think about how they would survive if stranded in the wild, the children work in small groups to construct a shelter using only a tarpaulin, 2 bungee cords and natural woodland materials. During this process the children are also encouraged to search and collect ‘tinder’ for their fires. Using a tool called a ‘flint and steel’ the children are taught how to build and manage a small fire for the purposes of heating and cooking. As part of this session, the children are given the opportunity to toast their own marshmallows. As for Bushcraft Explorer however this programme is extended to cover basic cooking skills. As part of this session, the children are given the opportunity to make s’mores and hot chocolate. Provided with a bucket of water, you will work as a team navigating your way over and through 18 obstacles including a climbing tower, a scramble pyramid, a zip wire, monkey bars, swing-bridge, our log walls, net climbs and a hammock-bridge. This challenge incorporates problem solving, leadership and communication skills. The aim of the challenge is for each team to complete the course and whichever team has the most water left in their bucket are the Winners. Warning you may get wet during this activity!! This hands-on challenge is designed to test both team and problem solving skills to the full! Working to a set of instructions, the children will be required to identify and sort the various parts and components of a ‘flat-pack’ scooter. Utilising their combined skills, the children are encouraged to adopt a careful and methodical approach to assembling the parts to create a winning scooter. Once constructed, each child will have the opportunity to take part in a team relay race against the other teams. Supports design and technology as well as mathematical problem solving skills. This session offers an introduction to the disposal of waste and the importance of recycling. The children will look at the ways we can recycle different materials and products and how we can do this (sell, gift, re-use, exchange). This session also looks at the secrets to composting and how we maintain our on-site compost heap! This is an inter-active session that also offers the students the opportunity to make their own recycled paper. Messy but fun! 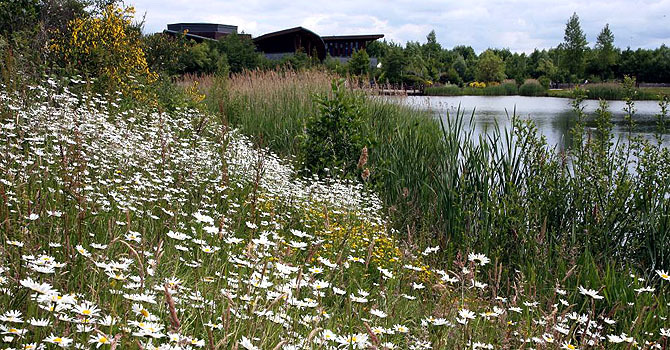 Learn about regeneration and sustainable development in this interactive Ranger-led session. Starting at the Barefoot Walk, the students will take a multi-sensory walk through 200 years of Conkers history, incorporating days of Victorian spas, coal mining and the development of the National Forest. The students will then be given the opportunity to view the whole site from the Conkers ‘Viewing Tower’. Here, the Ranger will explain how Conkers has grown and developed into what it is today. Working in smaller groups, each group will be presented with the challenge of how they would develop the Conkers site if they had 16 million pounds to spend. Working on a sheet of A3 paper, the children must compile their ideas before presenting them to the other groups.